Why Does AMZScout Have the Best Tools for Amazon Sellers? AMZScout has a web application and an extension for Chrome. Both tools are made for a similar purpose – to help you find the most profitable products to sell on Amazon. Here you will discover the distinguishing advantages of using these AMZ Scout tools. Listing quality score (LQS). AMZScout has a very convenient indicator that represent the quality of a listing. It is measured on a scale from 1 to 100. If you put your cursor on LQS indicator for a product, you will get the information about the advantages and the disadvantages of the listing. Estimated sales. 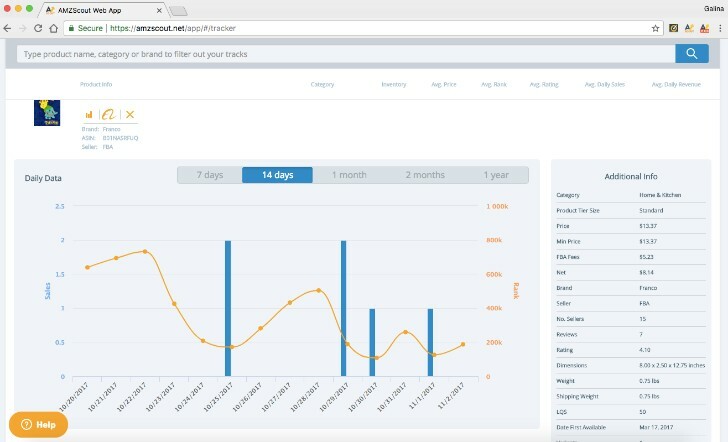 AMZScout tools for Amazon sellers uses a complex algorithms based on API statistics for the previous month. AMZScout is conservative and does not overestimate sales, unlike some other tools. Therefore, you will have a more accurate estimation of the sales and profit. Better on the safe side! Price history. AMZScout gives you information about changes in price from the date of the first availability (the date when this particular product was launched on Amazon). This information helps you understand how the seller changes the price and how much the seller reduces the price during weak sales periods or a low sales season. Trends. While choosing the right product to sell on Amazon, it is very important to pay attention to general trends and seasonal changes for sales. 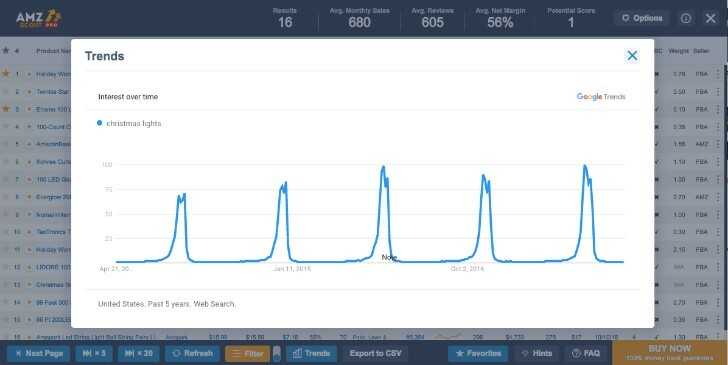 All the data on the interest for the product over time are uploaded directly from Google Trends. Take the search of the keyword “Christmas lights” for example. The searches have seasonal peaks. Return on investment. If you use AMZScout PRO your Profit Calculator will have another useful feature. It allows you to calculate the return on investment (ROI) for a particular product (if you are able to sell a similar quantity). To calculate ROI, all you need is to enter the product selling and buying price into the Profit Calculator. What does ROI mean? It is the ratio of profit to cost investments in percentage points. This calculation does not include the cost of shipping from the supplier to the Amazon warehouse (unless you included these expenses to your purchase price), advertising, marketing, and any other expenses. That is why you should always keep this information in mind and choose the product that gives the higher ROI. It’s favorable if the ROI is more than 100%. However, it is not an iron clad rule. Rank history. If you click on the “Rank” indicator for a product, you will see a graph. This graph demonstrates the changes of the indicator during the year or from the date of first availability on Amazon. Profit calculator. By having a built-in Amazon seller fees calculator, AMZScout allows you to instantly calculate possible profit. If you are an FBA seller, you have to pay Amazon Fees, that depend on size and weight of the product. You will no longer have to question You will no longer have to question “How much are my Amazon FBA fees” with our Amazon FBA Calculator for sellers. It is currently available on our website for free. Tracking of inventory. With Inventory and Favorites you can easily track the stock of your competitors. Watching the changes in competitors’ stock helps determine the exact amount of items sold. This information comes in handy in a number of ways while planning your own inventory including making you aware of the number of sales you would need to achieve a certain rank yourself. Try AMZScout Pro extension for free! Product database. The AMZScout web application is cloud-based. It uses its own database that includes more than 10 million products. 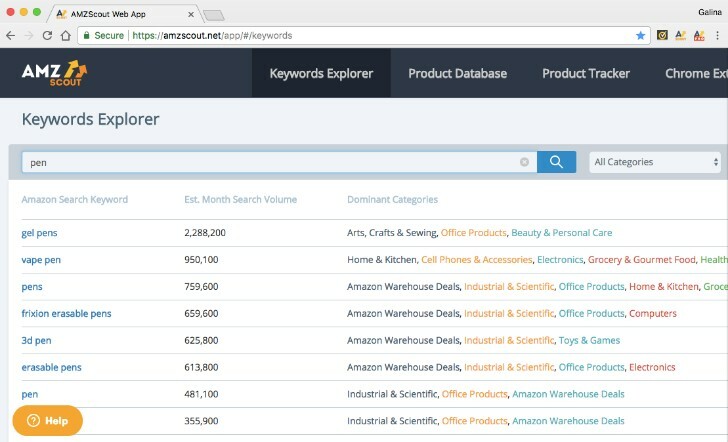 This database is unique compared to competitor’s databases giving our Amazon search tool an advantage to help you find the most profitable niche! Keywords Explorer. If you don’t have a clue where to start to choose a product to sell, start your research with this feature. The Web application is cloud-based. It lists searches for your keyword on Amazon as well as searching different combinations of a given keyword. Based on the information collected about the popularity of a keyword, you can choose the right niche for you. Product tracker. The “Product Tracker” feature lets you follow indicator changes for products you are interested in. For example, if you add competitor’s product, you will be able to see changes in price and rating, daily sales and reviews. Filters. The Product Tracker has a “Filter” feature that helps you find the most prospective market niche. Using the filter, you will be able to limit your search results to particular product categories. You can also enter minimum and maximum product prices, estimated monthly sales, number of reviews, LQS and so on. The AMZScout extension for Chrome also has a filter feature as well. Price tracking and Profit calculator. Like the extension, the web application shows changes in the product price. 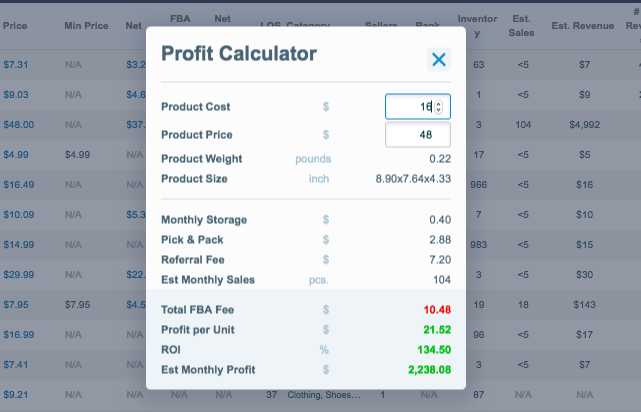 It also has a Profit calculator, that calculates your possible FBA fees and profit. Try AMZScout web application for free!